Starting your vegetables and flowers from seed is a great way to grow unusual varieties and save money at the same time. By following the directions on the seed packets, you will be successful. Each year, I clean my old plastic flats and inserts with a mixture of water and bleach to prevent disease. Flats and inserts can be found at local garden centers. This year, I’m also testing a seed-starting kit that uses soil plugs. Whatever system you use, choose inserts that will accommodate the size of the seedlings you will be growing. For example, I use 128-cell inserts for starting onions and leeks. I use inserts with larger cells for starting plants like melons, squash and tomatoes since they need extra room to grow. And I use deep-root inserts for starting peas, beans and corn because they provide room for large root systems. The best growing medium to use is a germination or seed-starting mix. Most contain peat moss and a combination of materials like perlite, vermiculite, fine sand or compost. Never use garden soil as it is too heavy and can contain disease, insects and weed seeds. Refer to the seed packets to determine when to start the seeds. Let’s use tomato seeds for an example. The packet tells me to start the seeds indoors two months before the evening temperatures outdoors reach 50 to 55 degrees Fahrenheit. Since I usually plant my tomato seedlings in the garden in late May, that means I should start the seeds indoors in mid- to late March. Packets also contain information on the seed-planting depth, how much to space the seeds, the amount of light the seedlings will need and when to transplant them to a slightly larger pot. Even though our growing season includes about 120 frost-free days – from mid-May through mid-September – the weather can vary considerably. Because of this, I always select vegetable varieties that will mature quickly. I primarily choose varieties that will ripen within 50 to 80 days, just to be on the safe side. Seed packets list the number of days to maturity. While it might sound like that refers to the number of days from when you first sow the seeds, it actually refers to the amount of time from when you transplant the seedlings into your garden until you can start harvesting. Once you have planted your seeds indoors in a flat, sprinkle a thin layer of finely-milled sphagnum moss over the surface. This inhibits the development of damping-off disease, a fungus that will kill off an entire flat of seedlings very quickly. You can find the moss, and a good selection of seed-starting supplies, at large garden centers like Northwest Seed & Pet. Cover the flat with a clear plastic lid to raise the humidity and place it under grow lights or in a sunny windowsill. Refer to the seed packet for the number of days the seeds will take to germinate. 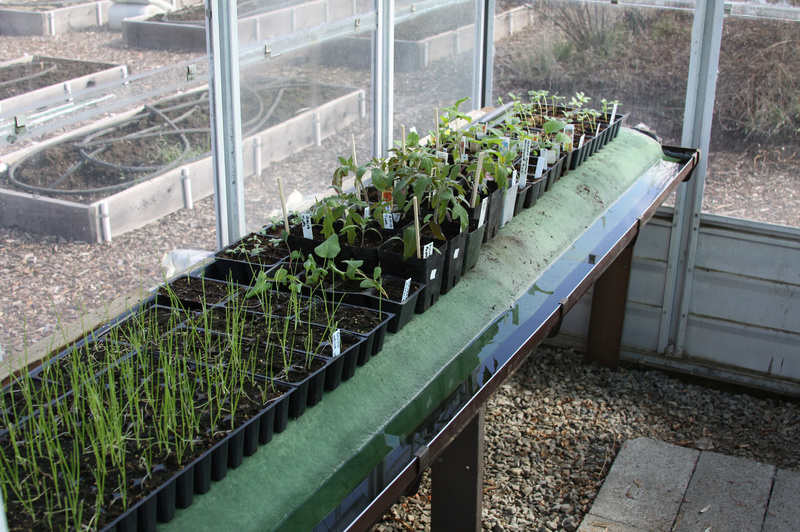 Once pepper, tomato or eggplant seedlings have grown a few inches, they should be transplanted into larger containers and fed with a half-strength organic fertilizer every two weeks until it’s time to move them out to the garden. If you want to start peas, beans, corn, melons or squash from seeds indoors, just plant them a couple of weeks before they can be transplanted out into the garden to give them a head start. You can find a vegetable seeding schedule online by going to the Spokane County Master Gardeners’ website at spokane-county.wsu.edu/spokane/ eastside/ and clicking on the “vegetables” link. Susan Mulvihill can be reached via e-mail at inthegarden@live.com. Visit her blog at susansinthegarden.blogspot.com for more garden tips and information.